It’s been a long week full of very late nights. I’ve been burning the midnight oil for several days now to finish two very cool archaeological stories for the news department at Science magazine. I can’t tell you what they are about at the moment, but I can say that I have been on the phone much of this week to two very different worlds. One story came from West Africa, where the cell phone connection crackled terribly during my phone calls and where one beleaguered researcher was having a lot of trouble picking up his emails. I really admire African archaeologists: they often work under incredibly adverse circumstances–barebone funding, miniscule technology, rapacious looting, and a whole lot of archaeologically unknown territory. One researcher I interviewed last year for a story was trying to excavate in a very politically troubled part of Central African Republic. He daily feared for the security of his crew. My other archaeological story this week could hardly have been more different. It was centered in Silicon Valley, and I spent long hours on phone with several NASA men who spoke effortlessly in aerospace acronym-ese. Planetary scientists and payload experts, they had the opposite problem from the Africans– so much cutting-edge technology, so many satellites, orbiters, probes and the like, that they hardly knew what to do with them. One of the reasons that I became a science journalist is because I love to learn new things and savor new experiences. It was clearly the right career choice. I had a lot of fun this week, journeying back and forth between Silicon Valley and the remote bushlands of Western Africa. 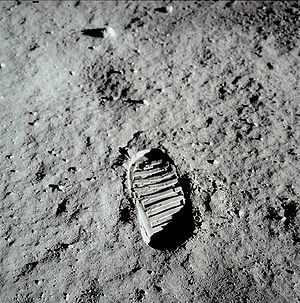 Today’s photo shows Apollo 11 Lunar Module Pilot Buzz Aldrin’s bootprint. It was taken on July 20, 1969. I’ve always admired the way NASA approaches its research! I volunteer to return to Tranquility Base and preserve those artifacts.